Cyn: Tomorrow is Father’s Day. It’s the one day of the year you’re supposed to appreciate your father, because the rest of the time you don’t. Hey, it must be true because Father’s Day would be unnecessary otherwise. What I don’t get about Father’s Day is that we are also expected to appreciate grandfathers, and maybe even brothers who have kids. 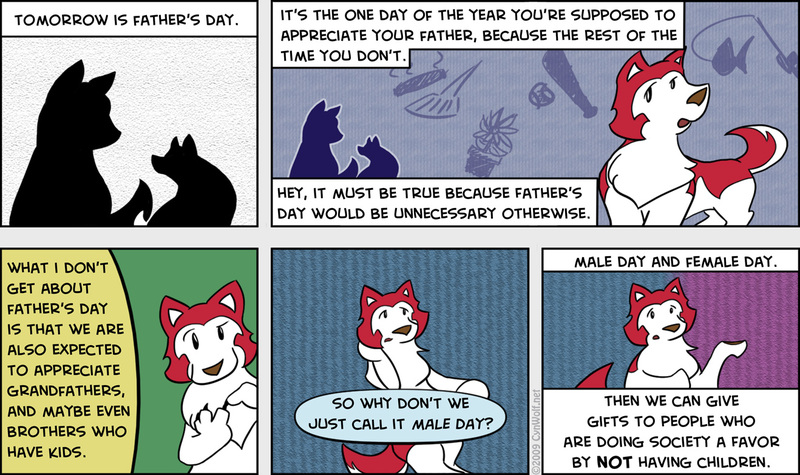 So why don’t we just call it male day? Male day and female day. Then we can give gifts to people who are doing society a favor by not having children.